Aarhus Docklands: Aarhus’s former container port is converted into a new city district. Henning Larsen Architects: Henning Larsen’s archaeology museum rises from the landscape just outside Aarhus. BIG: The Danish National Maritime Museum in Helsingør is an unlikely landmark, situated entirely underground. 3XN: A star-shaped plan and a sculptural staircase are two striking elements of UN City, a new building in Copenhagen. COBE: Young Danish firm COBE realizes one cultural building after another. OMA in Rotterdam: OMA’s De Rotterdam may be a controversial project, but it is of great importance to the city. 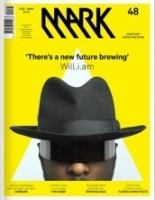 Will.i.am | Ben Mor in Los Angeles: Lifelong friends Will.i.am and Ben Mor take on architecture, Japan and Los Angeles for music video That Power. Langarita-Navarro in Madrid: With bright colours and a surprising use of materials, María Langarita and Victor Navarro realize buildings with a feel-good factor. Reconstruction in Germany: The German desire for the restoration of an idealized past is leading to poor architecture. Jakob + MacFarlane in Orléans: For the FRAC Centre in Orléans, Jakob + MacFarlane goes against its own philosophy, demolishing a structure before adding something new. Toni Maier in Los Angeles: Toni Maier is a Los Angeles-based location scout specializing in architectural homes. FleaFollyArchitects in London: Art installation Grimm City is a take on the folk tales of the German Brothers Grimm. Tacoa Arquitetura in São Paulo: Tacoa’s elevated apartments form a new building type. João Paulo Loureiro in Monção: João Paulo Loureiro stretches the limits of concrete spans with a double house in Portugal. Lola Sheppard in Toronto: Lola Sheppard talks about the margins of architecture and her attraction to Canada’s North.